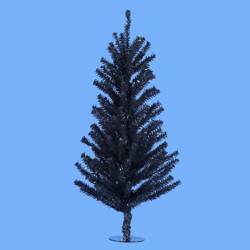 Home > Hallmark Collectibles > Table Toppers > Halloween - Black Mini Tree, 18"
Halloween - Black Mini Tree, 18"
This glossy black 18" tree has lots of branches for a nice display. PLEASE NOTE: Due to size, an additional $3.95 shipping charge applies to this item. This charge is not waived during shipping promotions and may be higher on International shipments. A perfect Halloween tree. You can hang a lot of Halloween ornaments on this tree or any ornaments that are a good contrast. Perfect size, nice and full, not sparse. Will be used in a man cave year round with collegiate ornaments. Two strings of clear lights makes it complete!